NetControl.net Archive of :: John Carpenter's ESCAPE FROM L.A. 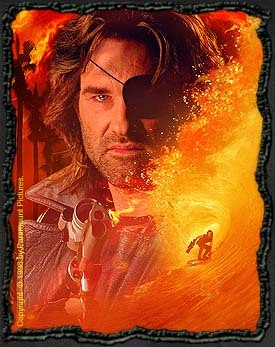 Legendary one-eyed outlaw Snake Plissken is back... and just about everybody thought he was dead! The year is 2013, and he doesn't really fit into the new, moral America. But they need him to accomplish an impossible job. He's headed for the most violent, sleazy, lawless no-man's land in the Western Hemisphere -- Los Angeles Island. In JOHN CARPENTER'S ESCAPE FROM L.A., Kurt Russell returns as Snake Plissken in Paramount Pictures' futuristic action-adventure directed by John Carpenter, written by John Carpenter & Debra Hill & Kurt Russell, a Debra Hill production which is a Paramount Pictures presentation in association with Rysher Entertainment. Here you can find out all about the Movie, download the Trailer, play great Shockwave Games, see exclusive Pre-Production Sketches, and even go on your own fun-filled, adventurous visit to that incredible hell-hole, Los Angeles Island. If you have a movie site or if you are a fan and would like "official" John Carpenter's Escape from L.A. banners click here to download. Link to https://www.escape-la.com.